Summary: I really enjoyed this ride and would recommend it to anyone who wants to change things up from Bayway or Skyline. It’s exhilarating to be on a commute to work where at times you can see no other buildings or people - it makes you feel much farther away from civilization than you really are. There are 3 dirt sections - sections 1 and 3 are easier technically, while section 2 is a little more challenging. If you haven’t ridden on dirt before, this is a good introduction. Section 1 gets you used to the feel of dirt and by the time you’ve arrived at section 2, you can handle the slightly rougher terrain. I have no special tires or equipment and I was fine. 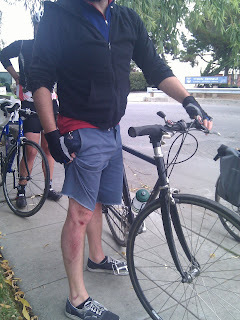 Details: We got off BART, biked for about 10 minutes and then entered our first dirt section. It was definitely dirt, but I had pictured something much more intimidating - something like the deep grooves of BTN mud, which in my opinion, share some of the same tire trapping properties as MUNI tracks. We exited dirt section 1, rode on pavement for another 10 or so minutes, and then headed on to dirt section 2. This section was more difficult because the stones over the path were larger than on the previous section. Still this was totally do-able for an intermediate cyclist like myself. I only slipped once here - and did not fall - w00t! Somewhere during the ride, we rode through Hayward, where there is no bike lane and a few rushed and rude drivers came within a foot of our bikes. There was very little traffic on the road though, so luckily the cars were few and far between. In Freemont, we entered a bike path, which started as a paved trail, and then transitioned to dirt section 3. This section was similar to the easier dirt of dirt section 1. By this time, I felt comfortable on the bumpy terrain and even found it fun! As we finished our last dirt section, we headed across 84 surrounded by the bay. Then it was back to our familiar Bayway stomping grounds - Sun, EPA, and finally Goog. coffee, and rode down to Millbrae listening to Le Show. of my many $1.10 tickets lying around the house. right!) waiting at the bottom of the escalator. Off we rode, and made the left onto Millbrae Ave. SNAP And there goes my chain. turned the crank to tighten it into the hitch receiver. SNAP And there goes my bike rack. We made it home on the cotter pin and slow driving. This is the 2nd time the attachment system on my rack - Thule "Helium"
something different this time. Never again. So much for my glorious return to SF2G. Next week maybe. the way, although we split into two groups by EPA. caught some minor road rash. extra 3 miles that I rode to get to Philz). > Roll-out from Philz at Folsom & 24th.